Peter Bichsel - very short, deceptively simple stories about people who are stuck in daily routines, poisonous thought patterns, or stifling inactiveness which keeps them from doing what they really want to do (for example getting to know the milkman, as in the title story). Sometimes stories have to be read several times before little inconsistencies appear. 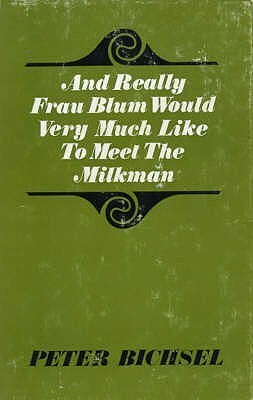 Peter Bichsel, And Really Frau Blum Would Very Much Like to Meet the Milkman, Trans. by Michael Hamburger, Marion Boyars Publishers, 1968. These are very short, deceptively simple stories about people who are stuck in daily routines, poisonous thought patterns, or stifling inactiveness which keeps them from doing what they really want to do (for example getting to know the milkman, as in the title story). Sometimes stories have to be read several times before little inconsistencies appear. For instance, there's a story about civil servants (Die Beamten) which is only 1 1/2 pages long. In it, the narrator describes the daily routine of these civil servants who leave for lunch at exactly the same time. They are presented as a uniform horde of people who are frightened whenever they don't sit at their desks. Towards the end of the story, some characteristics are named which only some of the civil servants possess, like fishing in their spare time, or an affinity for radish salad. But be careful: The first paragraph ends with: "they all wear hats" (sie tragen alle Hüte), but then the penultimate sentence reads: "...and there are also civil servants who don't wear hats" (..., und es gibt auch Beamte, die tragen keine Hüte). So which is it? Do they all wear hats? Or is that only our perception? Are we thinking of them as a bland collective of officials without personalities, so much so that we don't even notice when the narrator contradicts himself within a one-page story? Again and again, Bichsel describes little scenarios of people, who don't communicate or at least don't communicate the right things. Thoughts and fears are pushed down, ignored. Daily life continues.